The monophyly of Elopomorpha (eels and their relatives) has long been one of the most problematic issues in systematic ichthyology. Since Greenwood et al. (1966) established the Elopomorpha based on the existence of the leaf-like larval form, termed a leptocephalus, no one has corroborated their monophyly using character matrices derived from both morphological and molecular data during the last 30 years. We investigated their monophyly and interrelationships at the ordinal level using complete mitochondrial genomic (mitogenomic) data from 33 purposefully chosen species (data for nine species being newly determined during the study) that fully represent the major teleostean and elopomorph lineages. Partitioned Bayesian analyses were conducted with the two data sets that comprised concatenated nucleotide sequences from 12 protein-coding genes (with and without third codon positions), 22 transfer RNA genes, and two ribosomal RNA genes. The resultant trees were well resolved and largely congruent, with most internal branches being supported by high statistical values. Mitogenomic data strongly supported the monophyly of Elopomorpha, indicating the validity of the leptocephalus as an elopomorph synapomorphy. 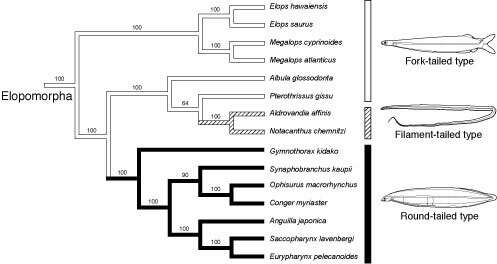 The order Elopiformes occupied the most basal position in the elopomorph phylogeny, with the Albuliformes and a clade comprising the Anguilliformes and the Saccopharyngiformes forming a sister group. The most parsimonious reconstruction of the three previously recognized, distinct larval types of elopomorphs onto the molecular phylogeny revealed that one of the types (fork-tailed type) had originated as the common ancestor of the Elopomorpha, the other two (filament-tailed and round-tailed types) having diversified separately in two more derived major clades. Inoue, J. G., Miya, M., Tsukamoto, K., Nishida, M. 2004. 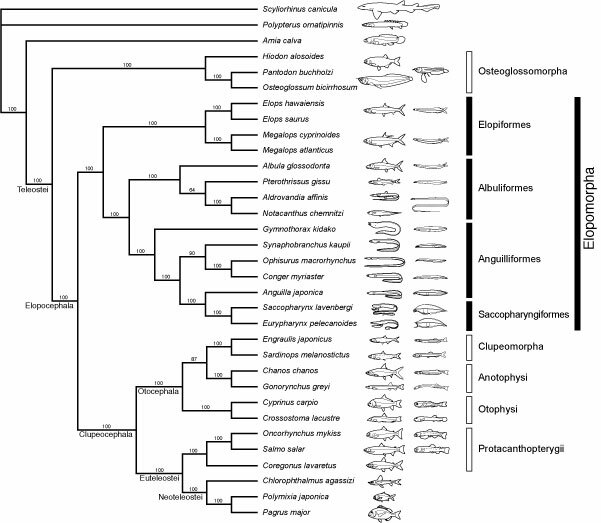 Mitogenomic evidence for the monophyly of elopomorph fishes (Teleostei) and the evolutionary origin of the leptocephalus larva. Molecular Phylogenetics and Evolution 32, 274-286.